“It’s the thought that counts!” I firmly believe this is true. Even if you are on a budget, you can show your loved one you care this Valentine’s Day. It just takes some creativity and savvy. 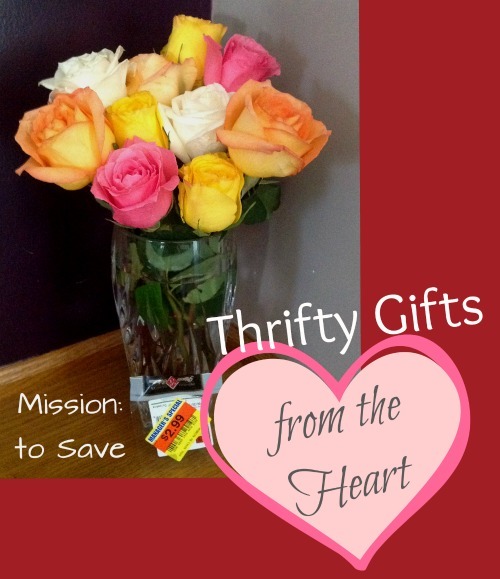 Check out these 5 thrifty gifts from the heart! 1. Budget Bouquet – Flowers are a staple for Valentine’s Day. Here is a tip to getting a budget bouquet. Check for manager’s specials! The floral department of my grocery store almost always has flowers on mark down. Sure you may not get 12 long stem roses this way, but you can still get a beautiful bouquet. Just trim off any fading petals, arrange them in a repurposed jar, tie a ribbon around it and voila! Also, you may find those roses on mark down a few days after Valentine’s Day. So surprise them with an extra gift after the big day! 2. DIY Gift Basket – Use store sales and coupons to stuff a basket full of her (or his) fave pampering items (beauty care, coffee, chocolate, candles and more). Search for coupons to save more and maybe even get some items for free! You can even find freebies by playing the drug store game! Make your DIY gift basket look professional by wrapping it in colored cellophane and adding a nice big bow! 3. “Sweet Nothings” Personalized Mug – Do you have a couple’s song, a bible verse from your wedding or a cute inside joke phrase? Why not use those words to personalize a white mug – in your own handwriting! Buy an inexpensive white mug (might even find one at a dollar store) and use a permanent marker to write your “sweet nothings”. Then bake it in an oven at 350 degrees for 30 min. Be sure to hand wash with tender loving care to keep your words intact over the years. 4. Gourmet Marshmallow Pops – These delicious treats aren’t just for kids. In fact, I know many adults that love marshmallows (my sister especially). Create your own gourmet mallows! Get shish-kabob skewers and pop on a marshmallow, then dip it in melted white or milk chocolate. Before the chocolate dries add some sprinkles for a finishing touch. Gather a dozen of these together for a delicious bouquet! 5. Handmade Valentine’s Classroom Notes – Don’t leave the kiddos out! This year instead of buying the run-of-the-mill cards for your child to give, why not try making your own Classroom Valentine’s Day cards. Take a kid fave like goldfish or fruit snacks, add a punny note and you have a fun and unique treat for the whole class! I love flowers. I should make one of these for my mom. It’d brighten her day. I appreciate anything handmade from the kiddos and I know they love the same in return. The Gourmet Marshmallow Pops sounds delicious. Great ideas! I love the marshmallow pops. My kids would have fun making (and eating!) these! Thanks! Love this! We try not to spend a lot of money on Valentine’s Day. This is perfect for ideas. Esp. loving the DIY gift basket. Thanks! I do those beauty care gift baskets often. My teen/twenty nieces love them! Thanks for checking it out Rebekah! Fabulous post! Pretty, helpful, and all the information in one spot. Thank you Missiontosave.com girlie!